IN 2012, THE DIAMOND JUBILEE YEAR, HER MAJESTY'S DIARIES ARE OPENED AT LAST... ***Offering insight from the top on all the major events of 2012, including the two Royal weddings, the phone hacking scandal, and the Duke of Edinburgh's tarts and vicars-themed 90th birthday party. ***'Had a quick run-through of the opening ceremony. One wanted to call it "The Empire Strikes Back" but it was generally felt that might intimidate the smaller nations. 'Queen of sixteen sovereign nations, Head of the Commonwealth, Defender of the Faith. She's one of the world's most well-known and powerful leaders and has reigned for 60 years. But what does she really think? 'One does enjoy the Eurovision Song Contest. Lovely to be reminded how much more civilized the British are than our European neighbours. Royal Eurovision Fancy Dress Party to celebrate. Unfortunately Camilla misread the invitation as 'Euro-tunnel Fancy Dress Party' and came as a train. 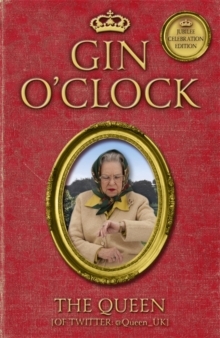 'These diaries reveal the seldom-seen workings of state and reveal how an octogenarian is quietly ruling the world and still has time for a gin.